Money makes the world go round — and when it comes to politics that seems to be especially true. At the same time, people involved in causes of politics and advocacy often find it harder to raise funds due to public cynicism about politics. Fundraising for liberal causes is therefore faced with serious challenges all over the globe, making this an area where international learning can be most beneficial. 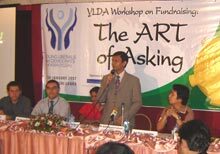 For this reason, the Young Liberals and Democrats of Asia (YLDA) started 2007 with a workshop on fundraising with the support of the Friedrich Naumann Foundation (FNF) in Colombo, Sri Lanka, from January 17-21, 2007. Twenty-three participants from nine countries attended the workshop to learn more about the strategies and instruments relevant to the fundraising of political youth organizations. The resource persons were drawn from a broad international spectrum, and they looked at various aspects of the topic: general principles of fundraising, strategic approaches and instruments, technical issues of proposal writing and actual national and international experiences. The governor of the Central Bank of Sri Lanka, Nivard Cabraal, gave a concise overview of the topic, while Siegfried Herzog, the resident representative of the FNF in Manila, looked at key elements of fundraising strategies. Emil Kirjas from Macedonia, the former president of the International Federation of Liberal Youth shared his experience in fundraising for a political network, and Dil Prasad Shresta from Nepal gave a detailed account of how to write good proposals. In addition, three of the member organizations of YLDA shared their own innovative techniques – from organizing dance parties in Nepal to selling raffle tickets in Hong Kong! “What emerged clearly was the need to address different potential sources with specific approaches: tapping a growing membership base, soliciting funds from supporters and donors and earning money through commercial activities. These all require specific skills and approaches,” said Herzog. “However, what is more important is to clearly communicate what the money is needed for,” he added. “Many organizations tend to think that fundraising needs to come before action; in reality, it is a clear purpose and a track record of action that creates the conditions for successful fundraising,” he concluded.